Welcome to another edition of Friday Favorites! This week we have some really great fall and Halloween decor! I hope it can serve as some inspiration as you prepare for Halloween and Thanksgiving! But before we get to today’s features I wanted to make a couple of holiday announcements. First off, I just posted information about my Holiday Gift Guide. If you have an Etsy shop or other small business that you’d like have promoted here during the holidays, I’d love to have you! Just check out my information post for details and send an email to simplysweethome@hotmail.com to get put on our calendar! 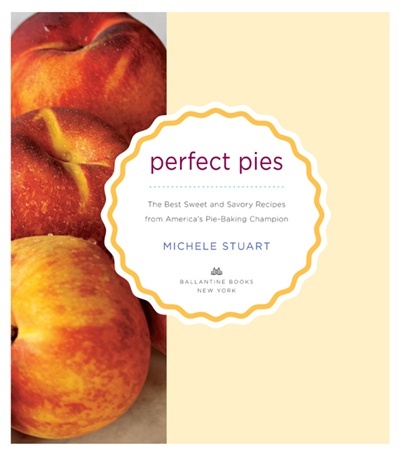 Introducing Mrs. Smith’s Signature Deep Dish Pies and a Giveaway! You can’t have holiday get togethers without dessert! Now with Mrs. Smith’s Signature Deep Dish pies making dessert just got easier, and it is just as delicious! The pies go straight from your freezer to the oven and bake up in 80 to 100 minutes (plus a 2 hour cooling time before serving). This is such a great time saver! Without having to make or bake crusts or mix ingredients, you can have a dessert that tastes like homemade! And you’ll be ale to spend that valuable time making your other dishes, getting ready for the party, or just having holiday fun! Beyond their convenience and great homemade taste, these pies are also easily customizable with their yummy toppings. 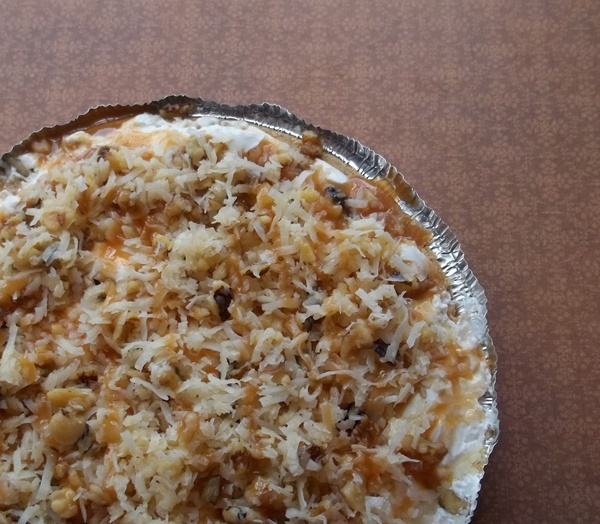 Use the topping that comes with each pie to decorate and add flavor, and also mix and match your pies and toppings! I recently had the opportunity to try these pies. Today I’m sharing the Pumpkin Pie with you. This pie fills your home with the fresh aroma of cinnamon as it bakes. And the taste is just like homemade! You will love the creamy blend of pumpkin and cinnamon, and to top off this pie, it comes with cream cheese icing! I think you will love the sweetness the icing adds to this classic dessert so much so that you may never want a slice of pumpkin pie without cream cheese icing ever again! 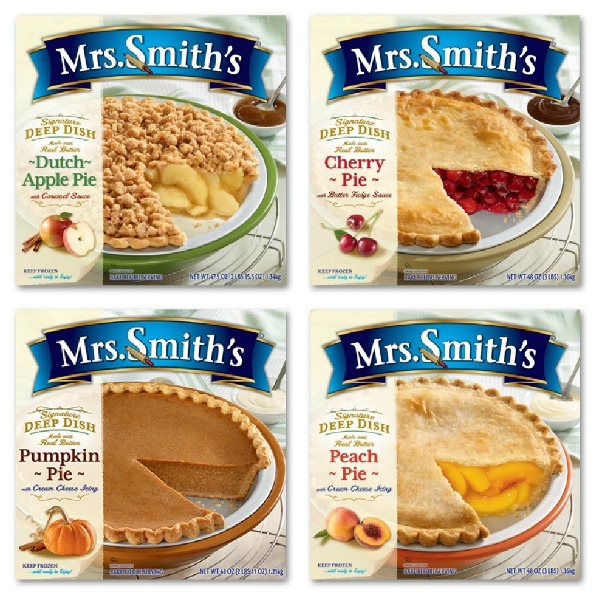 Mrs. Smith’s Pies are available at most Wal-mart Supercenters nationwide. Look online to find retailers near you. Connect with Mrs. Smith’s Pies on Facebook and Pinterest. Giveaway! One Simply Sweet Home reader will win a full value coupon for a Mrs. Smith Signature Deep Dish Pie (up to $8.99 value) and a $50 William-Sonoma card. To enter, please leave comments letting me know which of the four pies you’d most like to try and tell us how you would use this gift card. Then use the Rafflecopter form below. You can also gain extra entries by following Mrs. Smith’s on Facebook and Pinterest. With Thanksgiving around the corner, it is time to put together the final preparations for my Thanksgiving menu. Sometimes I make a complete meal for two here at home, and other times I just have to bring a dessert or two over to a family member’s home for the big celebration. But either way, I can always count on Country Crock to help make my recipes healthier and taste great. 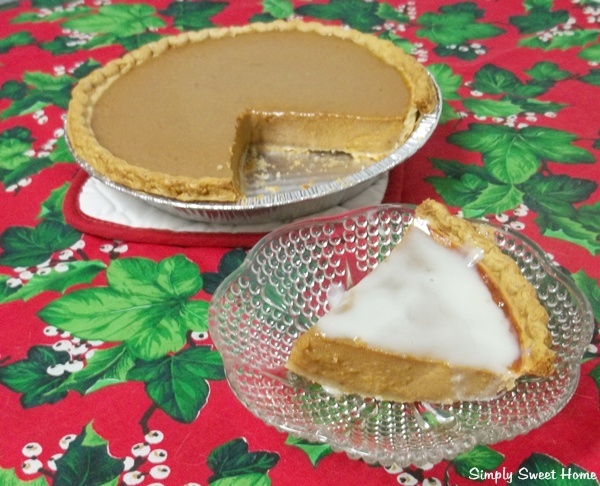 Today I’ve got 2 fantastic Thanksgiving desserts that were made using Country Crock. The first one is a blackberry cobbler. 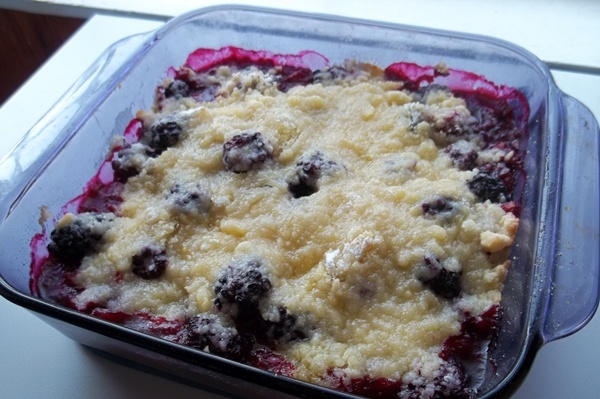 One of my dad’s favorite desserts is Blackberry Cobbler. 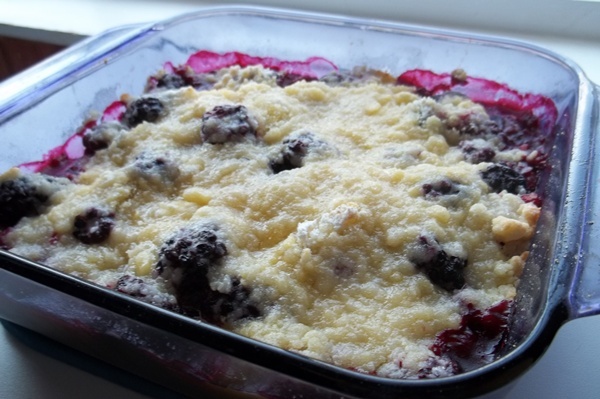 Over the summer, I found this great cobbler recipe that is super easy to make! I originally brought it to him for Father’s day, and he loved it so much, I told him I would make one for Thanksgiving. Directions: Preheat oven to 375°. 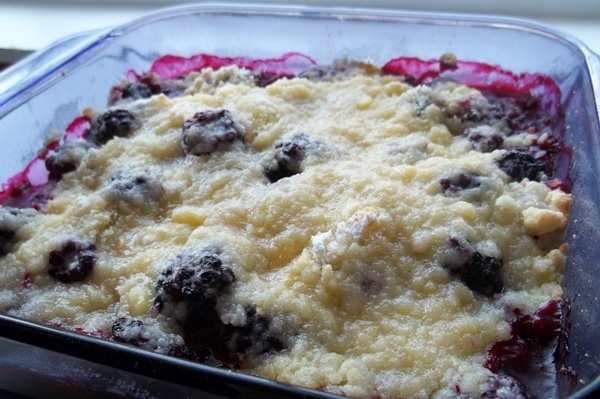 Place blackberries in a lightly greased 8-inch square baking dish; sprinkle with lemon juice. Stir together egg, sugar, and flour in a medium bowl until mixture resembles coarse meal. Sprinkle over fruit. Drizzle melted Country Crock over topping. Bake at 375° for 35 minutes or until lightly browned and bubbly. Let stand 10 minutes. Serve warm with whipped cream or ice cream. 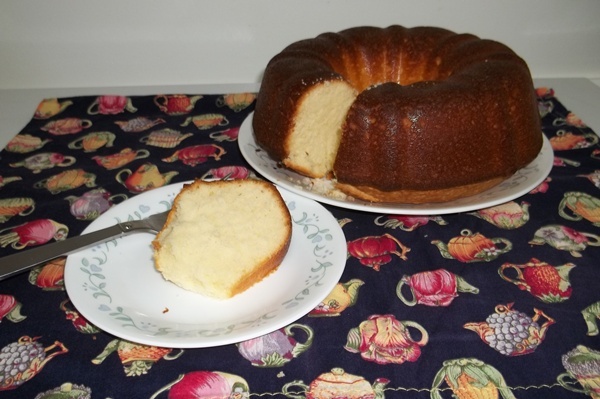 And the second recipe I have to share is a pound cake! 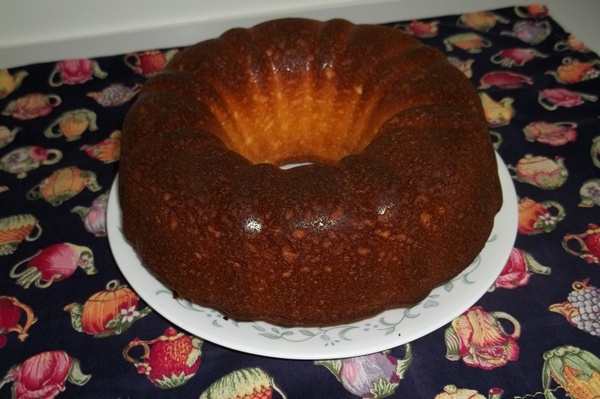 When I was a kid, pound cake was always on the Thanksgiving dessert menu! Pound cakes are perfect for Thanksgiving because, they are simple and they are loved by almost everyone. Today I enjoy experimenting with different pound cake recipes. 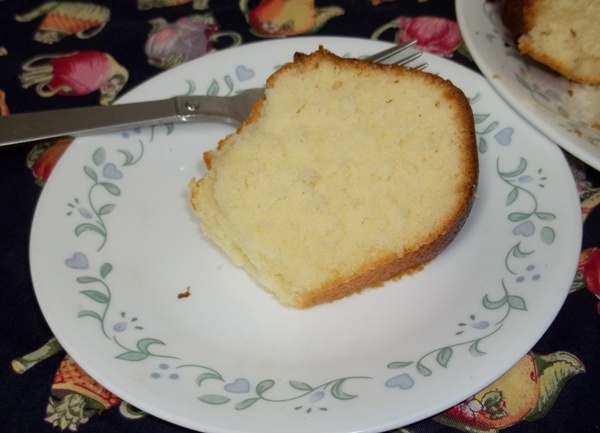 I recently tried out this new pound cake, and again for this recipe I substituted Country Crock for butter. Directions: Preheat oven to 350 degrees F. With a mixer, cream Country Crock and shortening together. Add sugar, a little at a time. Add eggs, 1 at a time, beating after each addition. Stir dry ingredients together in a bowl and add to mixer alternately with milk, starting with the flour and ending with the flour. Mix in vanilla. Pour into a greased and floured tube pan and bake for 1 to 1 1/2 hours, until a toothpick inserted in the center of the cake comes out clean. 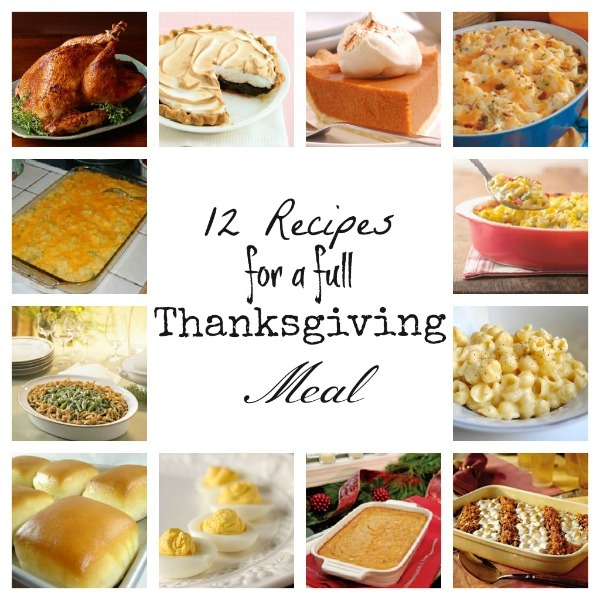 Au Gratin Potatoes, Thanksgiving Sides, and a Giveaway from Country Crock! As we prepare for Thanksgiving, a lot of fuss will be made over the turkey and dressing (or stuffing), but what about all the sides? Without sides the meal just wouldn’t be complete, would it? This Thanksgiving fill your table with vegetable sides, made using Country Crock. Country Crock has 0 grams of trans fats and goes great with every dish from corn on the cob and green beans to vegetable casseroles like Broccoli & cheese casserole and squash casserole. The Crock Country Chronicle In The Kitchen always has great recipes, veggie tips, and other fun ideas, and they have some side dishes that will steal the show this Thanksgiving! Today’s post is all about one of the quintessential flavors of fall: Pumpkin! It’s amazing how many things you can make with it: cakes, bread, cookies, cupcakes, and even donuts! And when combined with things like cream cheese and chocolate, the possibilities are endless! 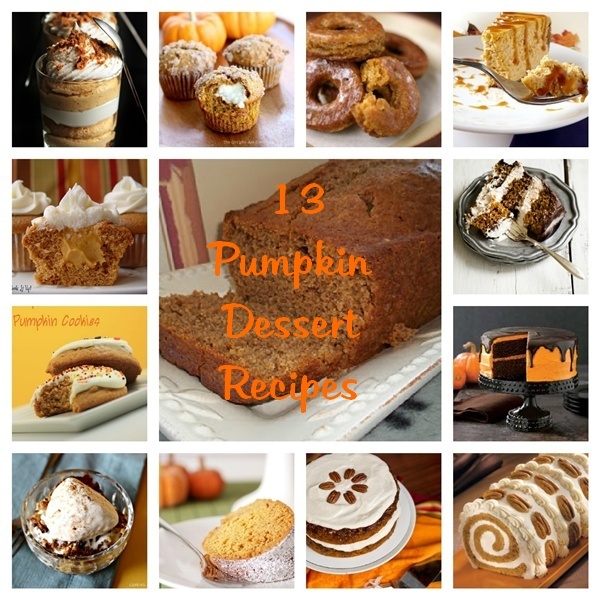 Here are 13 Pumpkin recipes that I think you will love! 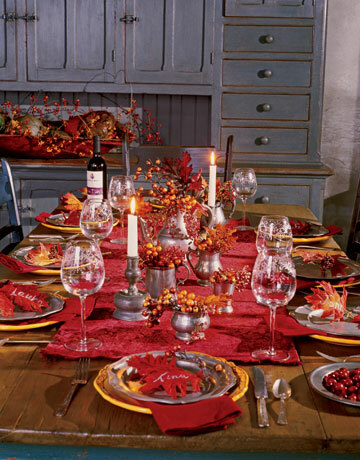 It’s not too late to think about adding a little fall flair to your Thanksgiving table. Here some easy and inexpensive, last minute ideas. Add color and style to your table using a table runner or place mats in red or orange. 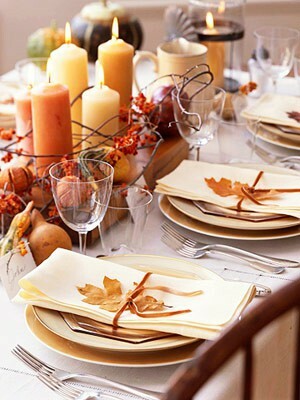 Then use faux leaves and berries to create an inviting tablescape. 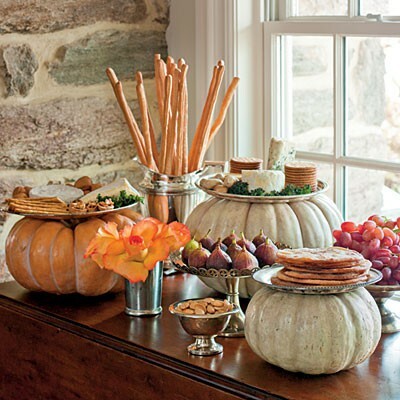 Create the perfect fall buffet by placing your food trays on top of pumpkins! 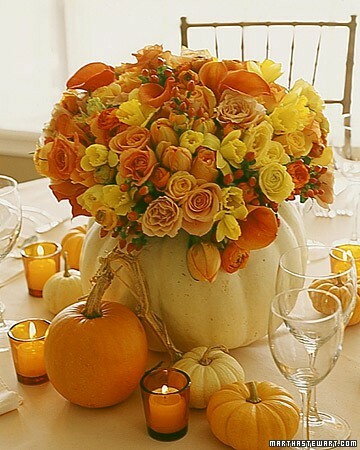 Or mix in some smaller pumpkins and gourds in and around your buffet. Here’s a display that’s easy and very inexpensive. 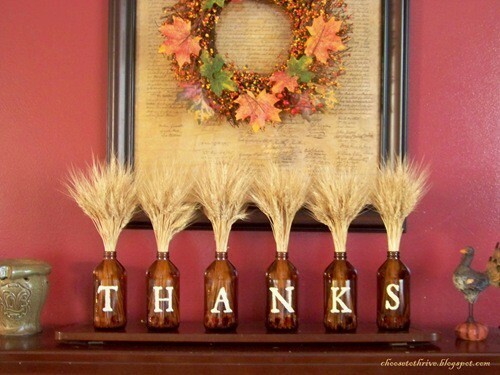 Take bottles or jars, and place the letters “T-H-A-N-K-S” on them. (You could even recycle some mayonnaise or jelly jars and just shake up a little pain inside to add color.) Then place straw, fall flowers, leaves, corn husks, or anything else you can think of in each one. The easiest thing you can do to add color and flair to any table is to add a bouquet of flowers. Faux will do, but fresh is said to be the way to go if you really want to breathe life into your room. And the best part is that the local grocer’s and farmer’s markets will have any leftover fall inventory on sale the week of Thanksgiving! And you can always count on candles to add color and a hint of warmth of and coziness to any room. And how about adding something fun for this kids? 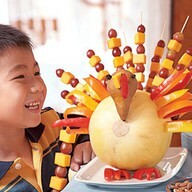 It just takes a few simple ingredients to make this cute turkey that also doubles as a holder for appetizer kabobs! With Thanksgiving right around the corner, it seemed like the perfect time to share this classic, Southern recipe. This Southern Brownie Pie is yummy served warm or cold, and it’s sure to please everyone at your table. My husband isn’t really a chocolate fan, and he doesn’t like pies at all, but he couldn’t get enough of this one! By the way, come join Love the Pie with TidyMom sponsored by Cherokee USA, Le Creuset, Wilton, Bags by Bloom and Harvard Common Press. Directions:First, make the pie crust. If you are not a good crust maker, you can use the frozen kind or the roll out kind. If using a frozen crust, let it thaw completely. Get a medium sauce pan. Put the milk, butter, margarine, and cocoa in the pan. Turn the heat to low and slowly warm until everything is melted and mixed together. Stir occasionally so the mixture does not stick to the pan and scorch.Take the chocolate mixture off the heat. Pour into pie shell. Bake at 350 degrees for 40 minutes in a 9 inch pie pan (50 minutes in smaller pan). The pie is done when the center is set. Tips for Serving: This is really good when it’s hot, but it’s also good served cold or at room temperature. After it cools down, to serve it hot again, place in the microwave for 15-20 seconds. Top with ice cream or whipped topping and chocolate syrup for an extra sweet treat!